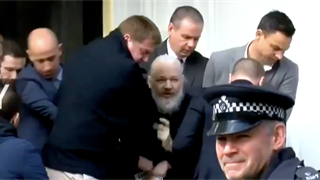 Julian Assange was arrested Thursday morning by U.K. authorities and will be extradited to the US for charges related to computer hacking. Pamela Anderson, an Assange supporter with a "romantic" connection to him, railed against the government for the arrest. Pamela Anderson lashed out at the governments of the United Kingdom, United States, and Ecuador for the arrest of Julian Assange, calling the Wikileaks founder a "hero of the people" and the UK "America's b----." 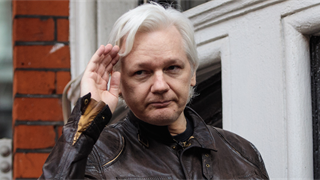 Assange has been holed up in Ecuador's embassy in London for seven years, fearing extradition to the United States for alleged crimes related to leaking national security secrets through Wikileaks. Ecuador apparently had enough: U.K. police arrested him Thursday morning and authorities announced he would be extradited to the US to face trial. The US Department of Justice announced the charges against him, for computer hacking, hours after his arrest. On Twitter, after Assange's arrest, Anderson lashed out and asked people to donate to his legal defence fund. I couldnâ€™t hear clearly what he said? 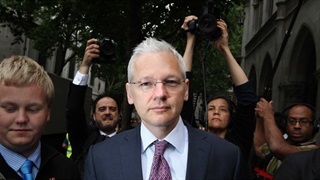 Anderson has been a longtime supporter of Assange, visiting him several times over the years. In August, she told Fox News they had a "romantic" connection. "He's not close to people like he is to me," she said. "There's definitely a romantic kind of connection because it's a romantic struggle."